Cassini will attempt to bounce signals off of Saturn's moon Titan once more during a flyby on June 18, 2014, revealing important details about the moon's surface. NASA's Cassini spacecraft is scheduled to fly by Saturn's moon Titan today (June 18) to learn more about the huge satellite's thick atmosphere and frigid, sea-studded surface. During today's encounter — the 103rd Titan flyby for Cassini over its long operational life — the probe will skim just 2,274 miles (3,660 kilometers) above the moon at a speed of 13,000 mph (20,920 km/h), NASA officials said. Cassini will bounce radio signals off the big Saturn moon toward Earth, where they'll be picked up by the antennas of NASA's Deep Space Network. Scientists will then pore over the signals for clues about Titan's surface, which harbors several large liquid-hydrocarbon seas. Cassini did something similar during its previous Titan flyby on May 17, bouncing signals off the moon's two largest seas, which are called Ligeia Mare and Kraken Mare. "We held our breath as Cassini turned to beam its radio signals at the lakes," Cassini radio science team member Essam Marouf, of San Jose State University in California, said in statement. "We knew we were getting good quality data when we saw clear echoes from Titan's surface. It was thrilling." Mission team members will also send radio signals from Earth to Cassini through Titan's atmosphere today, and the probe will respond with an identical signal. The experiment — which should reveal how temperature varies by altitude in the moon's nitrogen-dominated air — is tricky to execute. 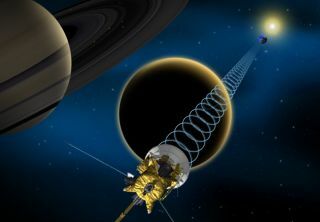 The signal has to be varied so that it remains constant when Cassini receives it despite the influence of Titan's atmosphere, researchers said. Cassini scientists have confidence they can pull it off, however, since they did so successfully during the May 17 Titan flyby. "This was like trying to hit a hole-in-one in golf, except that the hole is close to a billion miles away, and moving," Cassini project manager Earl Maize, of NASA's Jet Propulsion Laboratory in Pasadena, California, said in a statement. "This was our first attempt to precisely predict and compensate for the effect of Titan's atmosphere on the uplinked radio signal from Earth, and it worked to perfection." The $3.2 billion Cassini mission launched in 1997 and entered orbit around Saturn in 2004. The Cassini's operations have been extended through 2017, when the probe will end its life with a dramatic plunge into Saturn's atmosphere.